There is also an automatically generated What's New page for this site at Freefind which will show anything I've forgotten to list. Restored the episode guides. I'm aiming to restructure the site so that eventually each episode will have its own page, and have tried out a new format on episodes (1) to (14) with the screencap links as popups so the commentary and images can be seen at the same time. Added note about Charles "Bud" Tingwell. Here are some links to obituaries: The Times; The Independent; Variety; ABC Melbourne and his official website. Added seven new cuttings send by Steve West to the cuttings section, all dating from the early months of the show. More to follow later. Thanks to Simon Johnson for an observation on (148). Thanks also to several people who reminded me to add a note about Reg Evans' death. Thanks to Steve West for sending more clippings relating to the first year of Prisoner. I've added one to the home page to commemorate the 30th anniversary. More to follow soon. Added a banner ad to the home page for the Prisoner Recaptured event in April. Quick recommendation for the PCBH Alternative Forum, set up by Steve Hurst to allow some freer discussion of Prisoner (and other off-topic matters). 10.01.2009 You can now read Steve Hurst's review of 1986 which brings to a conclusion his reviews of the whole series. Added comments from Alan Alexander to (619); from Mark Caffrey to (667) and (668) ; from Dave Smith two further instances of Officer Barfield's first name, a comment on Myrtle Woods, and on episodes (86) and (240). Anyone who has emailed me within the last few months and not got an acknowledgement please try again at , as I've lost some emails and attachments in a hard drive crash on New Year's Eve. Which in a sense brings me full circle as there now ought to be at least one screencap for all the episodes apart from an isolated few. Email me at if you spot an episode with no screencaps at all where there ought to be one - if, say, there are new characters or a significant event not covered. Steve Hurst's 1985 review now has screencap illustrations for part 6, part 7 and the final part. Finally got round to updating the Edna Pearson page and the relevant episode pages to include reference to the additional cuts discovered in broadcast and DVD versions of (470) and (471). Thanks to the Canberra Prisoner Homepage for some of the information used, and to Steve Hurst for the use of the DVD of the Swedish versions. Steve Hurst's review of 1985 begins here. Screen caps only up to the end of part 5 so far, but all the text is there. Due to the permanent closure of the Recroom on On The Inside I recommend visiting the new Wentworth Forum here here and the new Prisoner Cell Block H chat room here. Thanks to Steve Hurst for the suggestion that Glen Paul and Paul Glen are the same actor. Screen caps for (507)-(510), (511)-(515), (517)-(520), (521)-(525) with some revised notes to the episode guides. Additional screencaps for the final part of Steve Hurst's 1984 review. Revised versions with pics of part 5 and part 6 of Steve Hurst's review of 1983. Watch out for 1984, coming soon. Revised versions with pics of part 2, part 3 and part 4 of Steve Hurst's review of 1983. Also added a button to the main grid to take you straight to the REVIEWS main page. Thanks to Mark Caffrey for comments added to episodes (577) and (581). I also removed a comment from (578) thanks to Mark's correction. At last ... Steve Hurst's 1983 year review. Only part one (of six) has screen cap illustrations at the moment, but parts two to six can also be read in text only format. Screen caps for these will follow soon. New or revised screencaps for (327)-(329), (331)-(334), (337)-(338) with a few new comments. 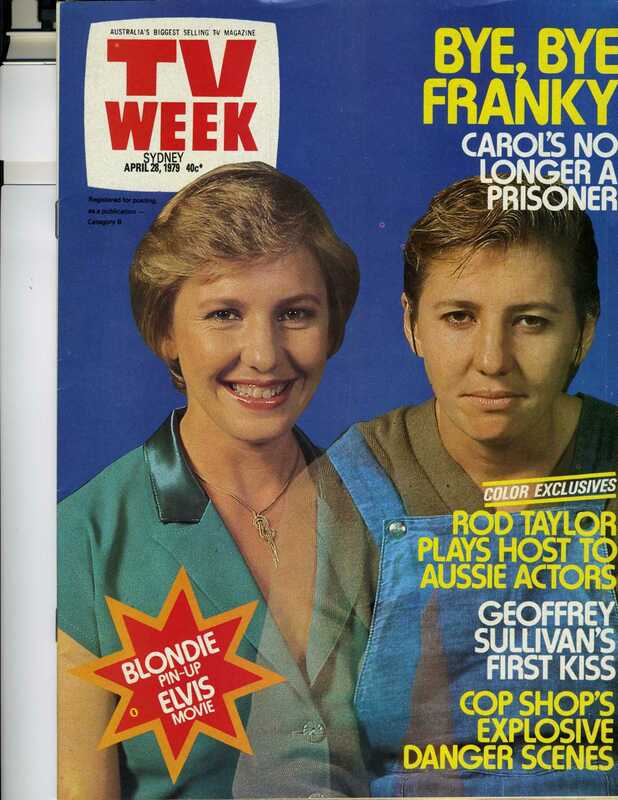 Major new section with scans of magazine articles about Prisoner at the time of the original run. Many thanks to Steve West for sending a selection from his extensive collection. Included comments sent to me by Andy Dolman on (307), Dave Smith on (404), "Alex in Sweden" on another name for Dr Weissman, Mark Caffrey to solve the mystery surrounding David Bridges' mother (415), and xihymn on the episode summary for (130) to correct the implication of the conversation between Paul Reid and Judy about her father. New or revised screencaps for (387)-(390), (391)-(395), (396)-(400), (401)-(405), (406)-(410), (411)-(415), (416) and added a few comments to the episode summaries. Further to Steve Hurst's correction of a credit for Tim Hughes in (122) is my own suggestion of where the credit might really belong. Added episode page selector to episode page. Thanks to Steve Hurst for a couple of corrections: a suggestion for the real actor who played Sgt Bentley in (122) and for pointing out that I had comments in the character pages about bomb squad men Major Hunt and Sgt Devlin who appeared in (387) the wrong way round. Screen caps for (255), (256)-(260), (261)-(265), (266)-(270), (271)-(272). I've also added some new comments to these episodes. Thanks to posters on OTI's Recroom for drawing my attention to mistaken attribution of (218), (226) and (237) to Denise Morgan instead of the real writer David Minter. Thanks to Kim Beissel who played Constable Cooper in (612) who contacted me to point out the credits had misspelt his surname. He was too polite to point out that I had further mangled it myself into "Bessell" on the character and actor pages - apologies for that. Thanks to Dave Smith for pointing out an early use of Officer Barfield's Christian name in (223). Changed the layout of the episode index with episodes approximately divided into groups by month and year of original broadcast. Removed the defunct Humanclick link wherever I could find it and replaced it with a contact email address. Apologies if you've tried to contact me via Humanclick in the last few years - it won't have worked. Next time I will start to attack some of the inaccuracies and errors I've found others have noticed - like Vera's non-appearance in episode (50); additional small cuts to the Edna Pearson plotline in episodes (470) and (471) (see the links page for the Canberra Prisoner page for more details); the non-existent 1987 season (I don't remember now what convinced me despite all evidence to the contrary that there was such a thing). Finally managed to get a working version back up again after it was deleted by my ISP (thanks a bunch, plusnet). With help from Bjorn W and cjbuckley who seems to have mirrored this whole site (at this address) without asking me (but thanks to him anyway as I had to copy it back). fence.htm Moved sites around and added a new one. Added a link in Erica's Outtray to the section on Special Squad which didn't seem to be linked from anywhere else. Changed the pictures on the home page to reflect the episodes I'm watching at the moment. fence.htm Moved dead sites to the bottom of the list and rearranged the others. Sad to see several favourites no longer around. Just a quick minimal update to see how long it takes. (Too long to do it every week is the answer). C02.htm, week426.htm Correction to character description for Annie Ross - thanks to Roger Campion for getting me to check this, and spotting an amusing continuity error along the way. No new PICs this week. The pics on the home page come from Joan's LSD trip in (413) which was shown in Australia last week. week002.htm, A26.htm Thanks to Roger Campion for his suggestion on the identity of an unidentified actress in (10) who plays an officer gossiping about Vera. sc/yr1980b.htm Updated descriptive listings of screen captures. Thanks to Bj�rn Wallgren for providing a transcript of the dialogue cut in the version of (123) shown on Channel 5 in 1997.
week020.htm Identification of another scene cut by Channel 5, this time in (118). Thanks to Bj�rn Wallgren for transcribing the dialogue of the scene. week196.htm PICs for (196) including one of Shane Bourne in another role. Thanks to Roger Campion for identifying him as the Esate Agent in (124) and for the extra information he provided about the actor. A16.htm, A18.htm, C13.htm Correction of misspelling of Susanne Haworth's name (as Howarth). week007.htm, A14.htm, C27.htm Corrected spelling of Carrillo Gantner's name throughout. I have also added a link to his IMDb entry on the actor pages (where his surname is spelt "Ganther", oddly). Bjorn also gave me the date when TV4 will resume showing Prisoner after their summer break. extras/uncredtd.htm Added links to PICs to illustrate Mark Cox's suggestion that Irene Nagle and Tracy Dixon are embodied in the same extra. sc/epis600cut.htm New page illustrating the cut from the scene of Eve's hanging in most UK showings previous to Channel 5's. keys/pga.htm Added "CHEAP REPRODUCTION" to the keys section. sc/yr1979b.htm, sc/yr1979c.htm, sc/yr1980a.htm Updated descriptive listings of screen captures. And thanks to Bjorn Wallgren for spotting three mistakes (now corrected) only a few hours after I updated the pages... ! week386.htm, week491.htm, week496.htm, week526.htm Identified a few episode numbers and added links back and forth to Nancy Banks-Smith's reviews in "The Guardian"
paddy.htm, stevef.htm Thanks to Sam Butler for new character profiles of Paddy Lawson and Steve Fawkner. week351.htm Thanks to Martin (of Beasknees fame) for more info about the erroneous credits for (351) and pointing out a mistake in my "reconstruction" of them. C25.htm Link to a new character profile for Nola McKenzie written by Sam Butler (many thanks). Apologies for being a week late. I might make the updates on alternate weeks until Sweden returns from its summer break in August. A01.htm Started to add direct search links to Internet Movie Database to actor pages in place of a general link to the site. extras/uncredtd.htm Added PIC link for episode (88) to "extras" entry for "May Worth" and also for Lil'n'Bev's first appearances in (91). meg.htm Corrected a mistake - thanks to chica_rebelde in the MSN prisoner chatroom. And added a few PIC links to the profile while I was there. week346.htm PICs for (347)-(348). Note to AWC of msn fanclub: please do not nick these screencaps or I either will stop doing them altogether or make them so boring you won't want them. Thanks. extras/index.htm Added a few new identifications to the spotters guide to background characters (mainly in the sections "Named Background Prisoners" and "Other Background Prisoners"). Thanks to Steve West of Blockade for some of the info. Most of the prisoner characters now have thumbnail pics. Sorry for the long break. Computer catastrophe and post-end-of-C5-run blues are the main excuses. When I was able to use the computer again, it was depressing how the site looks when the Braggadocio font isn't installed, so I've redone much of the site using GIFs instead. Proper update will follow next week but for now, I've given the silent backgrounders pride of place on the home page. wenttalk.htm Revised details of Wentworth talker to help anyone who wants to connect there on the night/morning the last episodes are shown. A12.htm Added link to screen capture of Greg Evans from "It'll be Alright on the Night 12"
week681.htm Extended summary and PICs for (684)-(685) and a comment after (683) - thanks to Anthony via email. week692.htm Thanks to Steve McGhee for emailing me with a description of yet another cut version of the final episode - this one from Grampian in 1996.
sc/index.htm Update to Prisoner Scrapbook - changes to layout only at the moment. week671.htm Extended summary and PICs for (674)-(675). extras/index.htm Revised version of spotters guide to background characters with thumbnail pics. fence.htm Added link to Shane's Inside View 2000.
week001.htm Extended summaries and PICs for (4)-(7). week661.htm Extended summaries and PICs for (664)-(665). intro.htm Updated to allow for Channel 5 postponing Sunday morning's episode. week656.htm Extended summaries and PICs for (659)-(660). C13.htm; C15.htm; C27.htm; C36.htm Corrected descriptions for the characters I had identified wrongly: almost all the minor male characters in (656), in fact. C35.htm Revised character description for "Sticky Beak" having identified him wrongly before. week651.htm Extended summaries and PICs for (653)-(654); C5 broadcast details for (655). mugshots.htm Completed mugshot page redone with thumbnails. week466.htm Noted the dates of Malta's summer break. week646.htm Extended summary and PICs for (648)-(650). week291.htm; week296.htm Added PIC links. week641.htm Extended episode summary and PICs for (645). epis452nazi.htm Hannah Geldschmidt's nightmare in episode (452)..
week636.htm Extended episode summary for (640) and PICs for (636)-(640). A10.htm; corecast.htm Added Officer Radcliffe to the core cast page. Thanks SROY81. week286.htm Thanks to Peter Rayner for original broadcast dates of (289)-(290) which come from a copy of "TV Week". week271.htm Added a comment made in the Digest by Roger Campion to summary for (272). week601.htm Error in the standard capsule episode summary for (601) spotted by Peter Schofield - thanks. cliffhan.htm Thanks to Chris Wathen (Digest 1245) for spotting an error about copyright dates (in connection with the supposed end of 1986 cliffhanger). edna/epis463.htm; edna/epis464.htm; edna/epis466.htm Edna Pearson pages revised with screen caps (thanks Tim) and an extra scene in (464) that I didn't notice had been cut until Tim pointed it out. week621.htm Extended episode summary for (625). edna/epis465.htm; week466.htm Edna Pearson revised - thanks to people in Malta and the USA. week601.htm Intriguing cuts in the version shown on Channel 5 as noticed by Mark Caffrey. search.htm Added an email link to the search page to encourage people to ask me direct if they fail to find what they are looking for. intro.htm Changes to reflect Channel 5 postponing Sunday morning's episode. pipes.htm Changed code for customised button to search dejanews for "pcbh digest" and added it to this page as well. week266.htm Thanks to David Breeze for comments on continuity in (266)-(267). week596.htm Incorporating some comments made by Mark C in Digest 1211 about cuts he noticed in the Channel 5 version of (598). A09.htm; corecast.htm Added the bumbling incompetent Pat Slattery to the core cast page: she is, as SROY81 has correctly pointed out, in more than 20 episodes. C10.htm Corrected entry for Officer Dixon. fence.htm Link to Prisoner cast at the IMDb corrected. week256.htm; week261.htm Added some mistakes spotted by David Breeze. week001.htm; week003.htm; week008.htm; week013x.htm; week021.htm; week206.htm; week306.htm; week311.htm; week316.htm; week376.htm; week416.htm; week446.htm Thanks to Mark C for a long list of credit corrections. More to follow soon. week251.htm Incorporating Robert's comments in Digest 1200 about episode (253). corecast.htm Added the missing targets that meant the links to this page didn't work properly. week241.htm Thanks to David Breeze for some comments on the change of uniforms in (244) ... and the continuity problems it seems to have caused. week236.htm Thanks to Jeff Tuck for pointing out a wobbly wall moment in (237) and to David Breeze who spotted a line fluff by Val Lehman in the same episode. week671.htm, week676.htm, week681.htm, week686.htm A final batch of uncredited characters and non-appearers from the last episodes recently shown in Sweden- thanks Kim (Rydvald). week591.htm Summaries for (592) to (595). writdira.htm; writdirk.htm; writdirx.htm Correction to director credit for (595) - Sean Nash not Kendall Flanagan. C02.htm Revised character description for Anna. week586.htm Episode summary for (588) to (590). reb.htm Added Reb's original sentence to her profile. week581.htm Episode summaries for (584) & (585). week692.htm Revised dates for showings of the final episode - info from Peter Schofield and from older Digests. Any more anyone? C28.htm Revised character description for Police Driver (583). library/errors.htm Another mistake in Terry Bourke. library/tb05.htm Link to errors page. week576.htm Episode summary for (580) and (581). C15.htm Amended entry for "Hash Slinger" to correct my assumption that it is Australian slang - thanks to Robert L in the Digest. week020.htm Watched (116) again and tentatively identified an uncredited actress. C04.htm, C27.htm. Revised character descriptions. I was so bored with the cookery contest first time round I couldn't be bothered to try to identify them properly. C33.htm Updated actress link for Jan Lord. week571.htm Slight correction to (574). hintgitt/chars.htm, hintgitt/index.htm, hintgitt/epis001.htm, hintgitt/epis026.htm, hintgitt/epis051.htm, hintgitt/epis076.htm Divided Hinter Gittern pages into smaller files. Episode summaries for (101) to (109) revised or added - sorry, some bits are still in German. English version to follow soon. A12.htm Addition to entry on Maureen Edwards - thanks Isobel. A32.htm New entry on actor pages for Peter Scott-Tulloch, who is not the same as Peter Tulloch. Thanks to Isobel for the correction. A36.htm Correction to entry for Peter Tulloch. C01.htm Correction to entry for character played by Peter Scott-Tulloch. C11.htm Corrected entry for Elliot Gardiner - thanks Martin. week566.htm Episode summary for (570). Also correction to comment on (568) - thanks Martin. week626.htm, week636.htm, week641.htm, week646.htm, week651.htm, week656.htm, week661.htm Uncredited characters and non-appearances - thanks Kim. C16.htm Character "Jack Burns" identified - also thanks to Kim. week371.htm Thanks to Louise and Steve West (no relation!) in the Wentworth Talker for reminding me of another couple of examples of onscreen douments readable with freeze frame in episode (371). week561.htm Writing team credits for (565) [foot of page]. backgrou.htm Updated information on backgrounder "Jenny", with a screen shot. Thanks to Martin! week206.htm Comment added for (208) - thanks Jeff. grace.htm Extended profile of Inspector Grace and moved it to its own page - thanks MJCamp for pointing out some omissions. week002.htm Added Susie to uncredited for (9) - thanks John in the newsgroup. week641.htm Comments added after (641) about the original run in Adelaide - thanks Scott.